Some excellent topics chosen for Issues, Theory, Formats [21st Century Bookworks]. Great in terms of content and form. 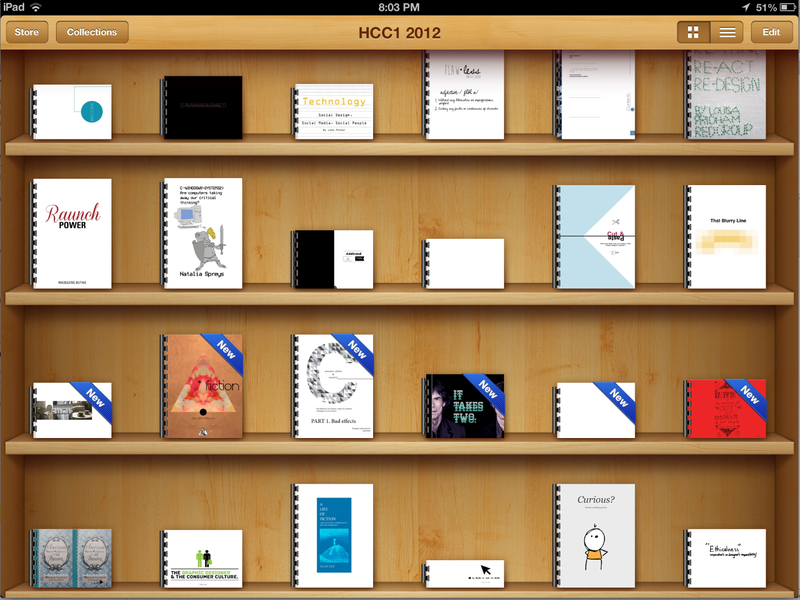 Most students choose interactive pdf’s (which appear in iBooks Collections as a spiral binding on the bookshelf). As they are best for maintaining formatting and design. However some students experimented with two or three formats to see what happened in the different formats (the EPUBS show as perfect bound on the bookshelf) and there was one iBook. So far I have them in six collections – one for each group. Hope to install on the WE504 ipad so you can read each others books as well as view them in the glass cabinets after Friday. The videoed presentations are looking good, and we will send link for you to login and view your own in not too long. Thanks Victorio and team.